It is not often that electronic music artists venture into projects with other creators, but it is even less often to come across artists whose collaboration becomes a stable and lasting union, accounts for most of the work they do and goes far beyond a mere sporadic partnership. When such a project becomes consolidated and mature and shifts from deejaying to studio production, we can say we’re facing a pretty unique scenario, especially if the artists manage to keep up the rhythm, quality and increasing recognition for over a decade. This is the case of Valentín Corujo + Héctor Sandoval = Exium. 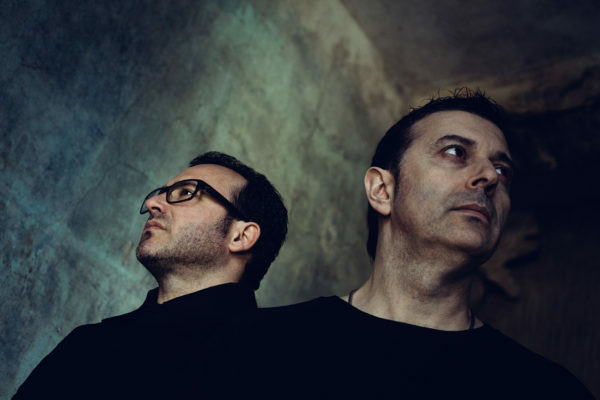 The success formula employed by this duo of deejays and producers from Asturias, Spain, that have yet to experience a setback in their career ever since in 1994 they decided to work together, is one of determined and solid effort. It is vital to stress that the creation process can be very different for solo artists that can devote to creation as and when inspiration finds them, in a spontaneous and anarchic way, and who can adapt to their changing mood, way of life, etc., from what it is like to create music when you’re part of a team: for each member of the partnership to contribute their best andfor them to put it all together is a much more complex process than what we may think. Achieving this and getting results in such quantity and of such quality as Exium have done, is an absolutely unique occurrence. Their early work attracted the attention of national labels Tsunami and Warm Up, and the fact that twelve years later they are still working side by side, speaks volumes. In 2000 they released their first 12″ in the English label Zet, which was followed by a long list: Polegroup, Equator, Numb, Audio Assault, Planet Rhythm, Labrynth, Main Out, Rxxistance, Recycled Sound, Reaktor or Infecta have released their creations. Their productions made their way into the sets of the most representative DJs and producers and nowadays feature in the sets of artists such as Dave Clarke, Oscar Mulero, Surgeon, Laurent Garnier, Luke Slater, Aphex Twin, and many more. From 2001, after they became resident DJs at club Rocamar in Gijón, one of the most important house and tech-house clubs in the north of Spain, and thanks to the success obtained with their first productions, they began to take their live performances to prominent clubs and festivals of the whole peninsula; it wasn’t long before their travels took them around Europe, wherethey’ve become regulars: Germany, Ireland, United Kingdom, Czech Republic, the Netherlands, Italy, Croatia…playing in clubsand festivals such as Tresor, Berghain or Awakenings. Their career as producers continued to grow and, after releasing several EPs on different labels, 2004 saw the birth of Nheoma, a label for them to give expression to their style with total freedom. Nine records later, amongst the names they have worked with we find artists such as Oscar Mulero, Christian Wünsch, Reeko, Fanon Flowers, Radial, Gayle San, Inigo Kennedy, Jeroen Search, Nick Dunton, Hiroaki Iizuka, Groof, Developer or Kwartz. In 2003 they took part in Oscar Mulero’s WarmUp Tour, and in 2008 they set up a new project called “Selección Natural” together with fellow countrymen Oscar Mulero, Christian Wünsch and Reeko. This laid the foundations for a great relationship between the five, whose work makes up a very important part of the best and purest techno that has been produced in the peninsula over the last decade. This affinity materialised in the creation of the PoleGroup platform, nowadays essential in terms of techno. Their music and sets have undergone constant evolution. From an outset marked by hard, rough and minimalist sounds, now they aim towards downtempo, minimal, dub, detroit or electro, a shift which has taken them to pursuing solo projects which allow them to give free rein to all their influences. In this facet, their work is signed with the aliases Kessell (Valentín Corujo and his new label Granulart Recordings) and Komatssu or Tensal (Héctor Sandoval). Besides deejaying and producing, their artistic zest has also led them towards the arena of visual arts, where they have collaborated with the Fiumfoto collective creating soundtracks for video installations and short films. Exium and Fiumfoto, who together form Exfium_;, give audiovisual concerts that combine experimental music, trip-hop, electro, electropop etc., and where the music is synchronized with several screens where images are shown. Thanks to this project they were awarded the prestigious Villa de Bilbao award, in the New Trends category. 2011 and 2013 set a new and important milestone along Exium’s path with the publication of their two LP albums: Roots of Time and A sensible alternative to emotion.These records released on nheoma and Polegroup are a demonstration of their incredible capacity and the degree of maturity they have reached after over a decade of working hard and with patience. Having received passionate critiques and a warm welcome only weeks after its release, these albums are proof that Exium have made themselves some space amongst the greatest artists of the Iberian techno and makes sure that a great future lies ahead of them.